Ann Elizabeth? | Scuffalong: Genealogy. Ann Elizabeth? – Scuffalong: Genealogy. My cousin L.E. sent me this photo a few days ago and asked if I could identify the woman depicted. I’d say the portrait dates from the 1880s to about 1900. It’s either a charcoal drawing or, more likely, a charcoal-enhanced photograph. 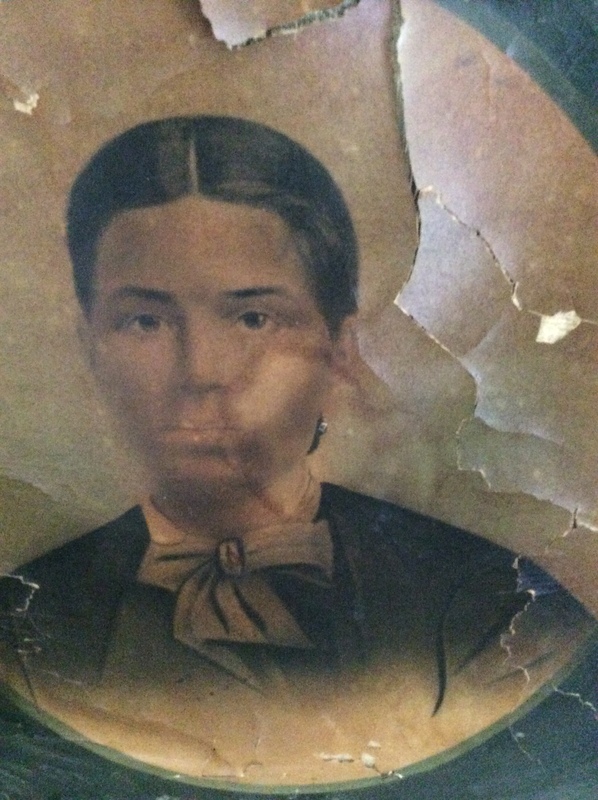 I believe it to be a portrait of Ann Elizabeth Henderson Simmons, my cousin’s great-grandmother, and sister of my great-great-grandmother Loudie Henderson. Ann Elizabeth was born in 1862 and died in 1900, which matches the portrait’s time frame. The woman appears to be in her 20s, which approximates Ann Elizabeth’s age at the early end of the portrait’s range. Ann E. died young, as did her daughter Annie C. “Dollie” Simmons Musgrave, and it makes sense that her photograph would have passed to Yancy Oliver Musgrave Jr. (1913-1988), the oldest of Dollie’s children. It is possible, of course, that the image depicts a relative of Oliver’s from a different line, but this seems unlikely. His grandfather Hillary B. Simmons had two older sisters, but their ages do not match well with the portrait. However, Polly Ann King Musgrave (1855-1935), Oliver’s paternal grandmother, is a possibility, and I have no real basis for eliminating her. I have photos of two of Ann Elizabeth’s sisters, Sarah Henderson Jacobs Silver and Carrie Henderson Boseman Grantham. Neither especially looks like the woman this photo, though they don’t favor one another either. Still, I have one very small additional basis for claiming this woman as a Henderson — the hint of protrusion in the lower lip. My grandmother had it and my father does, and so do some of their cousins. For now, I’ll regard this solemn lovely as my great-great-great-aunt. My thanks to L.E. for sharing a copy of this photograph. → Well-to-do farmer — with lots of children. Pingback: I did the best I could. | Scuffalong: Genealogy. Pingback: Nuptials. | Scuffalong: Genealogy. Pingback: DNA Definites, no. 15. | Scuffalong: Genealogy. Pingback: Lewis Henderson’s Simmons branch. | Scuffalong: Genealogy. Pingback: Collateral kin: McCullin. | Scuffalong: Genealogy. Pingback: Gravy. | Scuffalong: Genealogy. Pingback: Friend or family? | Scuffalong: Genealogy. Pingback: Memorial page. | Scuffalong: Genealogy. Pingback: Cousin Dollie. | Scuffalong: Genealogy.